Earn $5.93 in Rewards credit (593 points) What's This? Redesigning their Ultegra groupset to bring the pro-proven performance of the Dura Ace 9100 series to a more affordable price, the Shimano Ultegra FD-R8000-B Front Derailleur provides the features of the 9100 groupset with only a marginal gain in weight. Perhaps the biggest improvement is the R9100's new Link construction, that matches the force curve of the hand more naturally, reducing the effort required for shifting while simultaneously providing a lighter shift action. 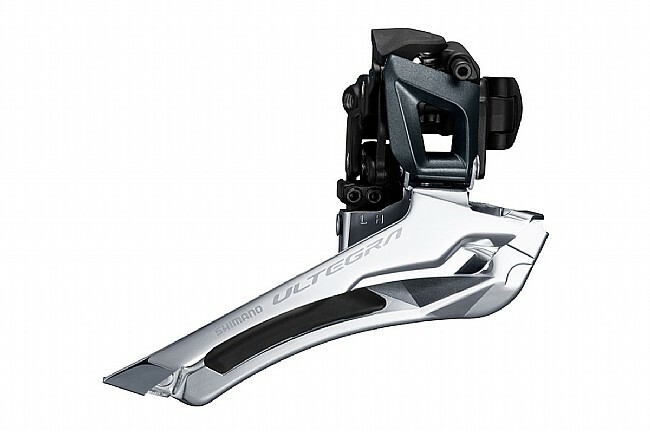 Designed with ease of use in mind, the Shimano Ultegra FD-R8000-B Front Derailleur sets up easy, and roadside maintenance can now be done without any specialized tools thanks to integrated cable tension adjustments.